Paropsis charybdis, the eucalyptus tortoise beetle, has been defoliating eucalypts in New Zealand since just after the turn of last century. This beetle is the most serious defoliater of eucalypts in New Zealand, but is normally only a serious problem for one group of eucalypts, those belonging to the subgenus called Symphyomyrtus. It can be quite difficult to categorise levels of attack to each species because sometimes strains within a species are more susceptible. E. globulus, E. viminalis, E. johnstonii, E. smithii, E. grandis, E. deanei, E. guilfoylei, E. macarthurii, E. longifolia, E. quadrangulata, E. dunnii, E. resinifera, E. scias, E. pellita, E. guilfoylei, E. leucoxylon and E. melliodora. Other species sometimes subject to attack include E. saligna, E. botryoides, E. robusta, E. bosistoana, E. rummeryi, E. propinqua, E. punctata, E. diversicolor, E. camaldulensis, E. teretecornis, E. brookerana, E. nitens, E. bicostata, E. maidenii and E. ovata. However, some species such as E.nitens, which is not usually severely attacked by Paropsis, can be subject to severe attack and defoliation when in a plantation situation. E.nitens is widely grown in New Zealand for wood fibre in large plantations and Paropsis is considered to be the most serious threat to the industry. Some eucalypts belonging to the other common subgenus, Monocalyptus, (ashes and stringybarks) are browsed by the adult beetles, resulting in minor, characteristic "scalloping" of older, mature leaves, but without the more serious damage to new growth caused by Paropsis larvae. Such browsing is often seen on E. fraxinoides, E. muelleriana, E. obliqua, and E. regnans. 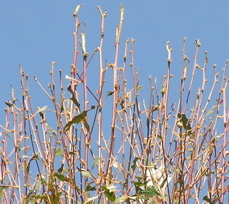 Defoliation caused by Paropsis charybdis. This level of damage severely checks growth and form. 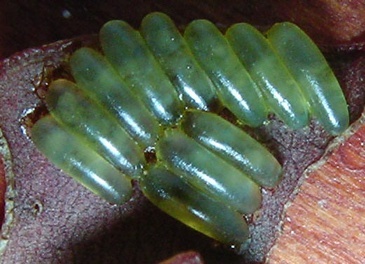 A parasitoid wasp Ennogera nassaui gave good biological control of Paropsis charybdis after it was released in the 1980's. However, in recent years it, in turn, has been parasitised by a hyperparasitoid, Baeoanusia albifuncle which has unfortunately arrived from Australia and very specifically attacks eggs of P. charybdis already parasitised by Ennogera. To further complicate things, fortunately there is now another parasitoid in New Zealand Neopolycyctus insectifurax that also attacks P. charybdis. Although this insect affords some control over P. charybdis, defoliation of susceptible eucalypts remains high. 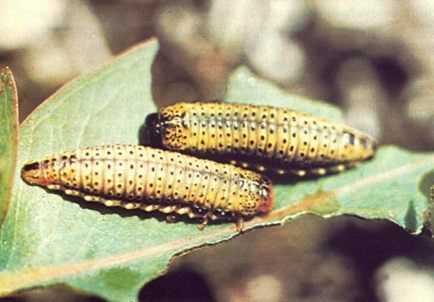 Many of the eucalypt species susceptible to Paropsis could be commercialised if an adequate level of control over Paropsis was achieved. In particular, for warmer areas, E. scias red mahogany because of its quality timber suitable for high value end uses and E. quadrangulata white-topped box, for its extremely durable timber, excellent form and fast growth. 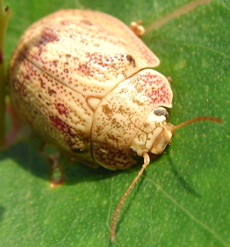 Colder climate species such as E. johnstonii, E. nitens and E. globulus could regain favour if biological control of Paropsis was to prove successful. Great news for tortoise beetle biocontrol - Sustainable Farming Fund application successful! Mitey promising biological control agent for Paropsis charybdis? Cleobora mellyi - What is it up to these days?